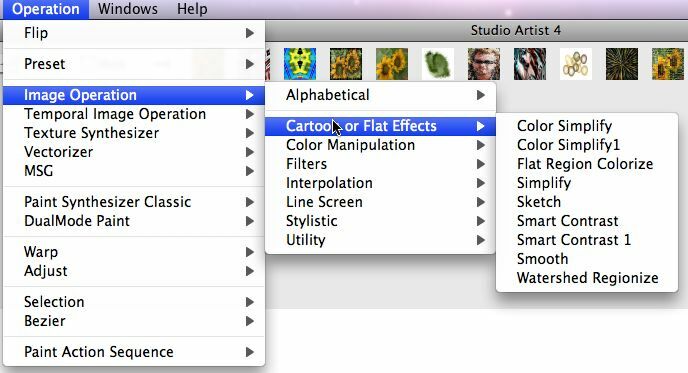 Studio Artist provides a number of different Operation Modes. Each operation mode is designed to provide a specific set of functionality. Some modes may only provide automatic actions to create visual effects. Others may allow you to perform interactive operations with the mouse or pen. Some may be both interactive and automatic. The operation popup in the main Operation Toolbar shown above can be used to assess what the current operation mode is as well as choose a new one when working. There is some logic to the ordering of the various operation modes in the popup. The first set of operation modes which includes Image Operations, Temporal Image Operations, Texture Synthesizer, Vectorizer, and MSG are various visual effects that are run by pressing the Action button or running the Action : Do Current Action Menu. The second set of operation modes which includes Paint Synthesizer Classic and DualMode Paint are digital painting modes. You can work interactively with the mouse or pen to paint and draw manually or you can press the Action button to paint automatically. The third set of operation modes which includes Warp and Adjust are only interactive at this time, they have no automatic action component. The forth set of operation modes which includes Selection and Bezier are interactive editing modes for doing region selection or editing or drawing bezier curves (vector paths or regions). The last operation mode, Paint Action Sequence, is associated with Studio Artist’s intelligent Paint Action Sequence (PASeq) scripting functionality. You can use PASeqs to build and playback sophisticated visual effects that utilize all of the other Studio Artist operation mode functionality. PASeqs are edited in the Paint Action Sequence palette. Pressing the Action button while in PASeq operation mode will run the current recorded PASeq as an action. The main Operation menu and it’s various sub menus can be used to access all of the different operation modes as well as any of the individual control panels associated with the individual operation modes. So you can use the Operation menu to easily navigate to all of the different editable control panels and their associated functionality. The alternative is to use the operation popup in the operation toolbar discussed above to navigate to a specific operation mode. You could then use the popup located in the Editor palette to access specific control panels associated with the current operation mode. Some Help browser pages also contain active command links that when pressed will reconfigure the interface to navigate to the associated operation mode and control panels. Here’s a quick explanation of the various operation modes. Image Operations – an extensive set of image processing operations, each with associated editable parameters that can adjust the visual appearance of the effect. Temporal Image Operations – time based image processing operations that work with multiple frames of the current source movie. Texture Synthesizer – resolution independent procedural texture based effects. Vectorizer – raster to vector conversion effects. Can be used to generate eps vector files or to create raster visual effects created by the vectorization process. MSG – modular synthesized graphics. An extensive modular image processing architecture that can create abstract imagery, fractal, or texture based procedural visual effects as well as configurable image or video processing effects. 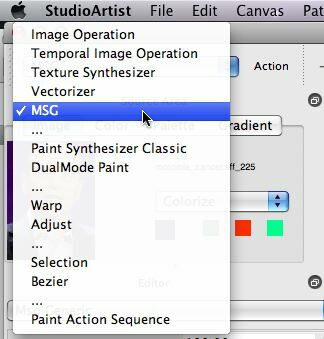 Paint Synthesizer Classic – the original Studio Artist paint engine rewritten and enhanced. Full support for all of your old Studio Artist paint presets. DualMode Paint – dynamic painting mode that simultaneously allows for interactive or automatic painting while running a second image processing effect in real time. Warp – a large assortment of interactive warp effects. Adjust – an assortment of interactive adjustment effects. Selection – interactive selection tools. Bezier – interactive drawing or editing of bezier paths or regions. Paint Action Sequence – scripting support for multi-step operations that work together to build visual effects.